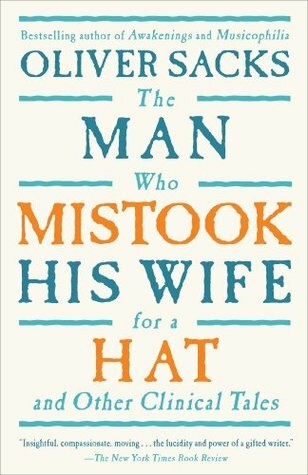 The Man Who Mistook His Wife for a Hat and Other Clinical Tales, Oliver Sacks, 1998 (c1985), ISBN 978-684853949, 243pp. Fiction has been a closed book to me lately, a combination of restlessness, being “burned out” by a force fed diet of horror, and thinking about fiction of my own. But the procrastination monster must be fed, and I found myself picking up this non- fiction work by Oliver Sacks the other day. And am I glad I did. I’m upset that it took me this long to get to it. Sacks’ book is a collection of essays (some previously published in The New York Review of Books, London Review of Books, and British Medical Journal) that are essentially case histories of his neurological patients. What that sentence doesn’t say is the pure wonderful style of writing that Sacks is capable of, and how that helps his topic. I must have looked aghast, but he seemed to think he had done rather well. There was a hint of a smile on his face. He also appeared to have decided that the examination was over and started to look around for his hat. He reached out his hand and took hold of his wife’s head, tried to lift it off, to put it on. 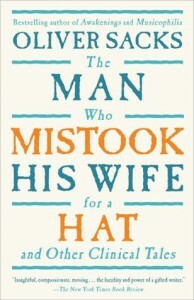 He had apparently mistaken his wife for a hat! His wife looked as if she was used to such things. That’s one essay out of 24 amazing and insightful essays about the ways we perceive through the use of a 4-pound muscle in our skull. The essay regarding “The President’s Speech” is almost Hunter S. Thompson- or P.J. O’Rourke-like. The “actor” is giving a speech on tv and the neurological ward is listening and watching. Most of the population has trouble comprehending the sense of words–instead they understand tone and inflection. Another segment of the population can only understand words (i.e. as if they were reading words rather than hearing them). Both segments come to a conclusion that the President is lying, yet the population at large knows nothing amiss. Sacks’ earlier book, Awakenings, was made into a movie starring Robert De Niro and Robin Williams. After reading this book, I see that Sacks will probably be mined for feats of the imagination for years to come.